Are you looking for cheap tickets to the awesome destinations of Batanes, Boracay, Busuanga or Siargao? Well, this is your opportunity to avail of low fares via the Skyjet promo fares June-October 2017! The Skyjet sale tickets are valid for one-way fares to these popular tourists’ haven. Round trip ticket can also be booked. Leave your worries behind, de-stress and enjoy a pleasant vacation to these remarkable places. “Slice of Summer” Skyjet promo tickets are good for trips on June, July, August, September, until October 15, 2017! 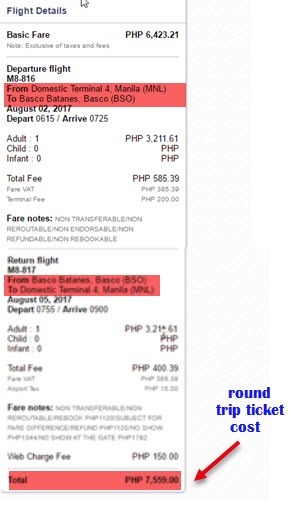 Low fares can be availed via online booking at www.flyskyjetair.com or by calling their hotline (03-2) 863 1333. Book your tickets until April 2, 2017 or until sale seats last. Limited flights on sale! Low fares of Skyjet Airline cover the base fare, VAT, 5 kilos hand carry bag and checked baggage of 10 kilos for adult passengers and 5 kilos for children. Excess baggage will be charged P150 per kilo inclusive of VAT. Skyjet sale tickets are non-transferable, non-refundable, non-reroutable, non-rebookable and non-endorsable. 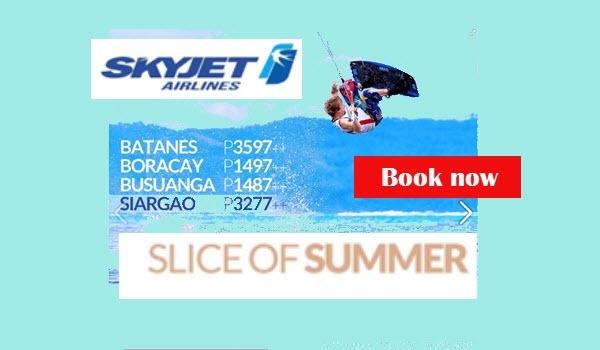 Travel to the hot vacation spot of Boracay, Busuanga, Batanes and Siargao via Skyjet. This airline has daily flights to Batanes and Siargao, fly to Boracay twice in a day as well as 4 flights to Busuanga (Coron), Palawan. Book your flights now. As travel period starts June 1 and ends on October 15, 2017, you have ample travel dates to choose from for a wonderful family bonding or amazing adventure with friends. Skyjet has also vacation packages; a tie-up with famous hotels which include roundtrip airfare, 3 days/2 nights’ accommodation, daily breakfast, roundtrip airport transfers, taxes and applicable service fees. View the available hotel and corresponding packages via this link: http://vacations.flyskyjetair.com/packages/. Do you need more promo fares, PISO FARE to Boracay, Batanes, Coron, Siargao or other local or foreign routes? LIKE and FOLLOW us in Facebook: PISO FARE Ticket for airlines’ promo updates and travel tips 2017 to 2018!!! May I have your BEST package tour for two (2) adults (one of which is a Senior Citizen) for Batanes on 19-21 May 2017 inclusive of reasonably priced accommodations, meals and tours.